I have some questions and I need some help. 192.168.20.137 while my flat_iface ip is 10.0.1.170. And I set the floating ip cidr as 192.168.20.137/24.Is this correct? because I use the server of my company. How can I set the floating ip correctly? memory snapshot)should I choose to resume base VM? After I log into the dashboard,I resumed bsae VM three times. One was successfully resumed,but the instance couldn`t boot. Unavailable console type serial respectively. 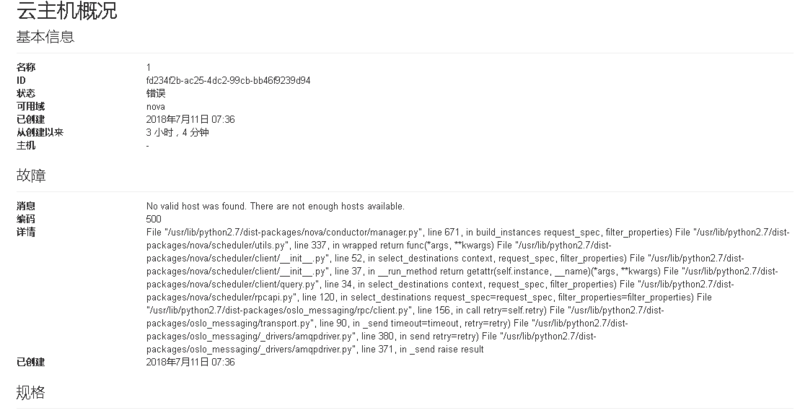 Where can I view the error log file in my linux OS? What can I do so that I can resume base VM successfully? 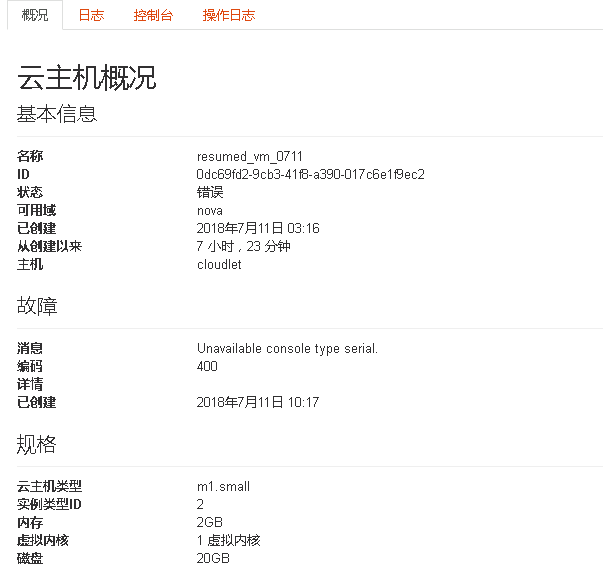 ,and I have refer to your paper System Infrastructure for Mobile-Cloud Convergence,in addition to this,Is there any more detailed information that I can refer to? Thank you for your patient advice. Question 1: 192.168.20.137/24 is possibly correct. It depends on your network. That IP doesn't seem like it is publicly addressable so there must be some NAT in there somewhere if you are able to get out to the internet from the host machine. I would check with your networking folks to see if 192.168.20.x is a valid subnet to use for your VMs. Question 2: You are correct that the imported image is stored as four separate files in Glance. However, when you go to resume a base VM from the cloudlet panel, you should not be presented with all 4 files. I should only list the base disk image. This is the only one that should be presented in the table and it is the correct one to select. Question 3: Typically the 'No valid host found' error indicates that the nova-compute service on the compute node (in your case it is the same as the controller since you have a single node) is down. There is a panel under Admin called System Information that will show you the status of the various OpenStack processes including the nova-compute processes on each node. You can also check it by doing service nova-compute status and, if it is down, service nova-compute start. You can check the /var/log/nova directory for logs that might indicate why it stopped. Once you have created a base VM and an overlay using the command-line utilities, you should be able to import it into OpenStack, resume a base VM, and synthesize a VM from an overlay (as long as that overlay is on an accessible web server somewhere). in Command line tool,the same mistake happened. Now I couldnt resume base VM，How can I solve my problem? More error information is attached. I thought you were able to resume a base VM from within OpenStack or is that not the case? It seems that there is a problem between your host and libvirt. Are you certain that virtualization is enabled in the BIOS on the host machine? What does lscpu output? Are you doing nested virtualization and if so, are you sure that all the CPU flags are being past to the outer VM? You could try also changing it from core2duo to kvm64 as the model. Before，I used VMware Workstation Pro on a Windows physical machine server create an ubuntu 14.04 virtual machine and then install elijah-openstack on this ubuntu 14.04 virtual machine. Is this what you say nested virtualization ,how can I past all the CPU flags to the outer VM which I create on the Windows physical machine server? the virtual machine) with ubuntu 14.04 ,and the CPU has the flag monitor . Is the elijah-openstack must be installed on a physical machine instead of a virtual machine,which they are all ubuntu 14.04? I guess it's duo to there only has one network interface card in my environment. Can I add a NIC to solve this ? I've seen in previous posts that if there is only one NIC in the environment, the flat_iface can be named as anything which is unique.Can run the entire Ansible playbook works? Though I haven't tested in a nested virtualized environment, it seems that some people have gotten it to work with some additional work(see that post I referenced in the last response). Typically I just use bare metal with Ubuntu 14.04. If you want to use the OpenStack integration, then you have to stay at 14.04 as we are currently bound to the Kilo release of OpenStack which doesn't support 16.04. If you just want to use the cloudlet library from elijah-provisioning, you should be able to use 16.04 also. If you only have one NIC, then you can have the Ansible script create a dummy network interface to use for the flat_iface. Just note that this does not persist after reboot so you will either have to perform the steps related to creating the virtual NIC manually or rerun the Ansible playbook with the --tags nova flag to recreate it. My guess is that you rebooted and this virtual interface doesn't exist and that is why nova can't launch the instance. From the README: If you only have a single network interface, make sure that flat_iface is something unique as a virtual interface with that name will be created when the one_nic variable in openstack-kilo.yaml is True. Please note that this virtual interface is not persistent and will be lost after reboot. To remedy this, you can run the entire Ansible playbook after rebooting which will recreate the dummy interface and restart the necessary nova services. I switch to a bare machine with Ubuntu 14.04，two NIC，then install the elijah-openstack script. 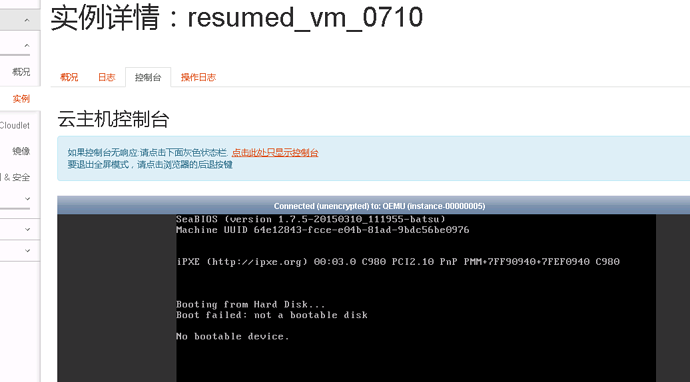 This time I resumed the Base VM successfully. I will do further experiment according to the README. I will consult you again if there is any question. and I find there is no strange in /var/log/nova. Why I stuck here for a long time?